Neuroanatomy is the foundation of all neuroscience. Yet, the application of neuroanatomical knowledge in everyday clinical or scientific practice can be difficult. The brain course at the Ludwig-Maximilians-Universität (LMU) München aims at illustrating and teaching anatomical issues as viewed from various neuroscientific disciplines. 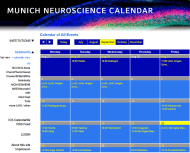 The Munich Brain Course is a yearly event held every spring. Each course has several main topics, with additional presentations and hands-on dissections. The upcoming course will take place on March 15th and 16th, 2019. As a sponsor of the Munich Brain Course, the Graduate School of Systemic Neurosciences at LMU Munich will select up to 5 Bachelor or Master students to participate in the 2019 course. Selected students will receive an award covering travel costs and course fees. Accommodation will also be provided. Bachelor or Master students enrolled (this translates to still having coursework to complete after the workshop in March 2019) in life science or natural science degree programs outside of Germany. Students can apply for one of the 5 scholarships from December 1st, 2018 until January 15th, 2019. Name, position, official address (university/research institute, etc.) and official email address of an academic supervisor, instructor or director of studies who will be submitting a letter of recommendation. Please be sure to combine all of the above in one single PDF document and list Munich Brain Course 2019 and your last name as the subject of your email! A letter of recommendation supporting your application from an academic supervisor, instructor or director of studies must be submitted to gsn@lmu.de on official letterhead by January 15th, 2019 to complete your application. Please ask your referee to include Reference for [your name] in the email header.